WireCrafters, the leading producer of wire mesh panels and partitions in America. 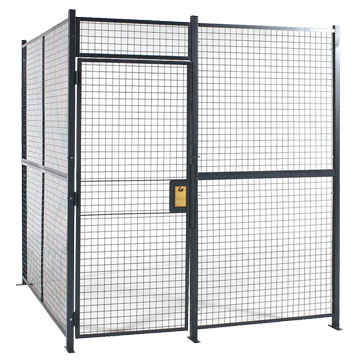 Having initially developed wire cage products like security cages and tool cribs, WireCrafters found a growing need for machine guarding on the factory floor. Required on the factory floor are OSHA machine guarding compliant barriers to protect workers in the proximity of industrial robotic work cells, CNC machine access points, and as a wire mesh fence surrounding other factory floor equipment that is dangerous to workers. WireCrafters uses the woven and welded wire mesh designs to also make industrial storage lockers, technician lockers, guardrail systems, industrial handrails, security cages, tool cribs, drug storage centers, computer server cages, evidence storage lockers, and pallet rack enclosures. HTE Automation is your resource for all your Wirecrafters needs if you are located in Kansas, Missouri, or Illinois.